First off I think it's important to have some idea of what you are expecting. Know what you want your dog to learn. A good trainer is always one step at least ahead of your dog. So that if your dog reacts a certain way she will know what to do to in force a wanted behavior. Also you should be able to ask your trainer to help you with specific things that you want your dog to learn. There is no use in teaching a dog certain cues if you don't intend to ever use it. 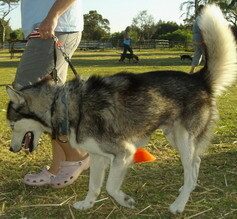 Use cues on things you want your dog to know so that you don't waist time, effort and words. Make sure that you understand what your trainer is showing you and your dog. Puppy classes are just a tool to teach you how to train your dog at home. Is your trainer a positive rein forcer? Meaning does she use conventional methods like choke collars, pulling dogs to heel and scolding at them? Or is she patiend, listens to your dog and watching his body language while reinforcing wanted behavior rather then punishing the dog when he does not succeed. These are just some guidelines to look out for. Remember obedience training is not about sit, stay and down but teaching your dog to wait to cross the street, "talk" when you want your dog to talk and so that you can tell your dog not to talk by giving the cue. Sit stay and down can help for these things some times and can come in handy. But training should be about daily situations. You will also learn things like walking at heel. If you are not planning on taking part in dog shows there is no need for your dog to walk 100% next to you. Your trainer should explain this to you as well. You will learn to play hide and seek with your dog and to let your dog know how to search for you by following your scent. All these things are great for socializing your dog and helping you bond with your dog. Just do it in a way that you are both having fun. Take treats with you to class to make sure your dog has some off the good stuff to motivate him. Your treats should be about the size of a regular thumb nail. When you see your dog doing something that you like even if it's not on cue reinforce that and later move on to only reinforcing when you give the cue. Classes are usually over six weeks once a week. If your trainer gives you notes, read through them and keep them for reference. This is just a short summary of what you should expect from puppy classes.